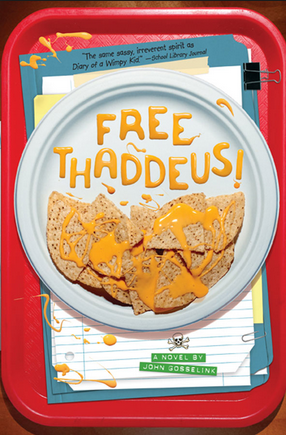 Free Thaddeus, a novel by John Gosselink, is an exciting story told by a 7th grader named Thaddeus. Thaddeus is a perfectly intelligent student who has interesting ideas about how the Crooked Creek Middle School should be run. Unfortunately the principal Frank Cooper has different ways of thinking. When Thadeus implements one of his ideas: the true emergency drill, the principle snaps and sends Thaddeus to I.S.S. or more commonly called In School Suspension. Thaddeus thinks this punishment is too severe for what he did, so he writes his defense, which is the book. The book Free Thaddeus is exciting and entertaining. I would recommend this book to people who have a sense of humor, especially if they are in middle school. The book is mainly comprised of Thaddeus’s opinions of how his school should be run and reasons why he should not be in I.S.S. Also, if you have ever been misunderstood and then been mistreated because you were misconceived, then you can relate to the book. In Free Thaddeus, I especially like the letter Mrs. Dixon, one of Thaddeus’s teachers, writes to the principle, in which she ridicules the decision the principal made in regards to Thaddeus. “He brought some “heart healthy”diet tips he found on a web site and “accidentally” left them on my desk, right next to a box of doughnuts I had brought as a special treat to myself for putting up with Thaddeus for a week.” said Ms. Dixon to the principal in a letter. Although Thaddeus means well, his actions are very insensitive and rude. Thaddeus and the teachers have different points of view which play out in the course of the book. All in all, I believe that Free Thaddeus was a great book about a troubled child’s opinions on life.